Technische Daten is marked with a * and at the bottom it says: *Herstellerangaben, I don't know german, but google translates it as manufacturer's data; so they are infact marked. But you are right about the other two, the 4.0s doesn't have any legend, but the 3.9s from the Viper vs Ram it is a manufacturer claim, why? because in the technical data it says that the Viper did 3.6s, anyway you were right. I don't have any doubts that someone with a sensitive foot on the accelerator should be able to hit 100 kph in under 4 seconds. The low end torque is amazing, no need to slip the clutch, it won't bog. The problem is feeling the available traction and only feeding in as much power as the tires can take without spinning. Lumpy idle made the whole car shake, that was my first clue that I was in for a wild ride. all three cars acceleration number are clearly NOT marked as manufactor claim ..in that case they would be marked with a * as the legend at the buttom of the datasheet claims.. I still haven't found that 0-100km/ of 4.0, but those 3.9 are manufacturer claims, (didn't dodge claimed 0-60 in 3.9s? )The articles state that. The Viper has been tested from 4.2 to 4.8s to 100km/h, yes, I know that AMS and Sportauto aren't the only magazines, I just forgot to mention others. I once saw a video footage of a former DTM racer explaining how to luch such cars ... I was shocked how many things they need to do and how many things can go wrong... the line between a 2.7s 0-100km/h start spinning wheels or stalling the engine is pretty small..
starting a Viper it is of corse less complicated in preperation but pretty sure even more difficult to get the maximum traction from the tires without spinning the wheels and producing smoke or starting with to low rev.. I run over a video of Manuel Reuter testing a 2005 Viper SRT-10 convertible there they claim a 0-100km/h time of 3.6s! his claim..the Viper needs skilled drivers..
Getting so much power to the ground does take skill and practice. The owner of the one I was riding in at the autocross had wheel spin difficulties coming out of every corner, and he was a skilled driver in his own car and moderated his throttle very carefully. the second test was already a 3.9s 0-100km/h time for the Viper SRT 10 convertible in a direct compare to the C6 Z06 and Audi R8.. I know but, I try to find from where they came from and for example I couldn't find the 0-100mph of 8.3, a 8.36, yes, but that rounds up to 8.4, and the 0-200km/h I'm pretty sure is an assumption based on the 1/4 mile time of 11.8 @ 123.6mph by motortrend I think, I can't recall right now, but that time was never matched again in any test. 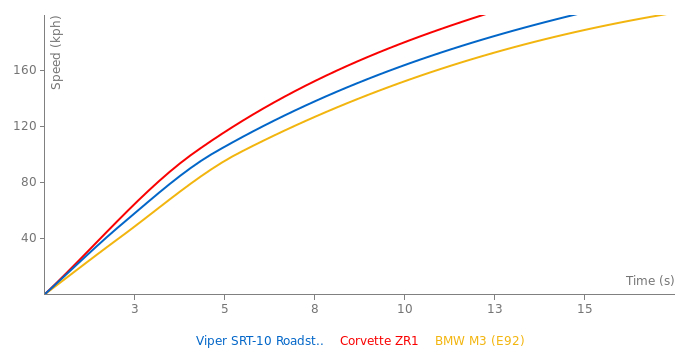 I do my research, obviously, and a 0-200 faster than 13.8 was inexistent in any sportauto, AMS, autobild, autozeitung tests, can you really believe that the '03 viper is faster accelerating than the C6 Z06? I don't. The same can be said about the 0-100km/h, the fastest is 4.2 by sportauto, and then are some 4.3 and 4.5 times, but no 3.9, albeit, there were plenty of 3.9 0-60mph times from car and driver, motortrend and road and track. Real 0-100mph is 8.4, which was done with rollout, so it correlates perfectly with the 8.9 0-160km/ obtained by AMS in 2006. Can we consider changing them? I'll add them but as they are slower than the actual (incorrect) data they're going to get rejected. Great car, especially on a track. I got a chance to ride in a 2004 model SRT-10 roadster on a tight race course. The owner was a racing acquantance, we competed in the same class, and we were at a test and tune event (before regular competition season). Brutal acceleration, very tight suspension tuning (definitely better than the C5 Corvette that I was driving!). 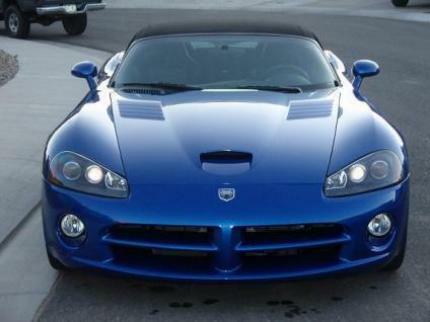 You do know the 2008 Viper has 600bhp right? 510 hp is correct. There is no need to change. It was power certified, not modified in anyway. From 2003-2008, there were absolutely no changes to the Viper's engine. Nicely spotted br, Change power please. 500bhp, and 525 torques, please change. and 0-200kmh should be 11.7, as it passes the 1/4M in. They have the exact same power. The change was only a result of the SAE change in measurement. And the 2003 Viper had 500bhp, and 525lb ft, not 510bhp, that was for the 2005 model. You have, SOME truth in what you say. Nothing can beat a Viper except some Uberexotics...Z06 and GT-r are about even...GT-r is only faster because of 4 wheel drive and some ultra-sticky optional tires. And a Viper is cool, a GT-R is ugly, big and heavy...nobody even notices it unless you are familiar with the car. I'd rather have a 100hp Viper than a 1000hp GT-r...but I respect it nonetheless. I think all sportscars are good cars, some just better than others. The zo6 and the gtr can beat the viper in a grag race. It's V10 engine requires 9.5 litres of oil to fill it! Still, horses need about 20 litres of water a day so even IF they drank oil they would still be thirsty after emptying this Viper. Coupe times from Top Gear, Variano, and Nurburgring belong here. Any tests before 2005 belong here as well.